Supporting Dorset's outdoor performing arts festival. Extraordinary events in extraordinary places. Since 2005, the Inside Out Dorset Festival has presented high quality, large-scale, outdoor events to more than 100,000 visitors, combining incredible artistic work with extraordinary Dorset locations. 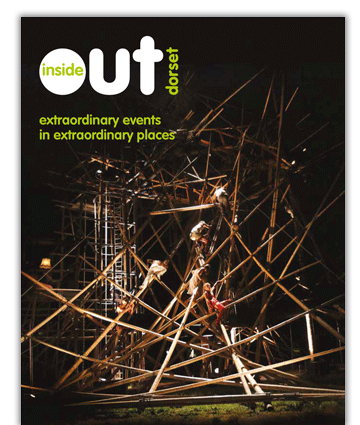 We've worked with Activate Performing Arts, the company behind the production of Inside Out Dorset, since 2006, and have helped them with the print and digital design and the marketing for the festival. Inside Out Dorset faces a unique challenge in that their events tend to take place in unusual and sometimes remote outdoor spaces. This presents a wide range of issues such as accessibility considerations, visitor navigation and parking, and audience way-finding. In tackling this, we developed a strong colour scheme and created a number of custom illustrated maps, which are used for both helping visitors find their way, and for audience-guided walking trails around the festival. We worked with Activate to produce brochures, posters, flyers and adverts for Inside Out Dorset. The brochures had to act as programmes, and communicate information surrounding the work, but they were also essential for visitor information, such as accessibility details and funding information.